Do any of you have this problem at your house? Three. It’s the magic number. Yeah. The nits would live on breakfast cereal if I let them. And sometimes I do. So I buy a lot of breakfast cereal. Trouble is, someone doesn’t always close up the box, and the cereal gets stale. It’s so easy to roll down the inner wrapper and then close the box. Who would just walk away and leave the box open to the elements? The boy says he doesn’t do it. The girl says she doesn’t do it. I certainly don’t. But somehow the box doesn’t get closed up properly and the cereal within gets stale. The kids then refuse to eat it. Because who wants to eat stale cereal? Mommy doesn’t. But she will anyway. Because she’s Mom. And she has to buy this stuff, week after week. And she doesn’t want to see it go to waste. Is she annoyed? Hell yeah. 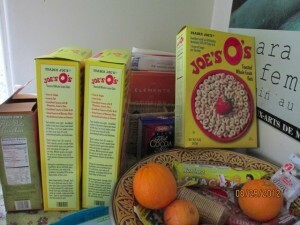 Because why should she have to eat stale Joe’s O’s all of the time? She puts the damn food on the table! She should be able to eat fresh Joe’s O’s AND the blueberries AND the last strawberry too. And should she have to hide the $4 basket of raspberries just so she can have a small handful to use in her morning yogurt? NO, she shouldn’t. She shouldn’t have to wash every bowl in the pantry over and over and over all day long either. What’s wrong with these kids? They can’t close cereal boxes? They can’t wash a bowl? 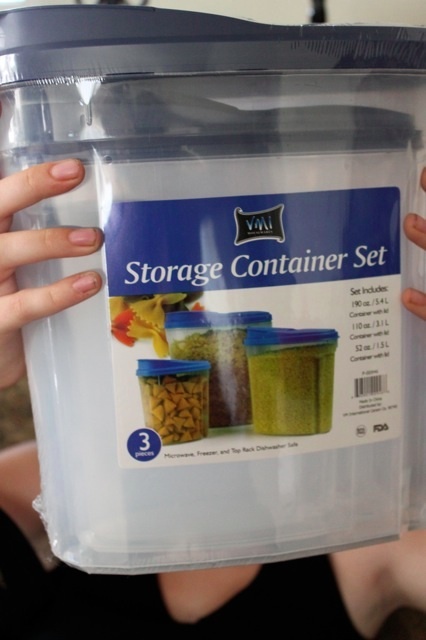 The problem is so pathetic that Marisa brought over a set of new plastic containers. “Put the cereal in these and they won’t go stale,” she said, regarding me with pity. When neighbors take it upon themselves to stage an intervention, you know it’s gotten out of hand. Will these save the day? I gestured feebly at the other boxes of cereal. Those on the table. Those in the cupboard. “But what about all these?” I asked. I’ve heard that advice before. My problem with socks is a little better, thanks. But the school year is only now about to start. Talk to me in a few weeks about where all the matching socks went. And talk to me in about three weeks about how many boxes of cereal I’m still buying. This very issue has threatened to undo me on more than one occasion. Can you post a picture of the plastic containers please? My cupboard, where our cereal is stored, is deep and tall. So, to utilize the space more efficiently, I have one of those wire stacking shelves at the back, and my cereal boxes are on lined up it. However, the boxes cannot be stored upright, they are on their side with the box top facing the cupboard opening. Hence, one cannot leave the box undone. To do otherwise would spill cereal all over the inside of the cupboard. I also have a rule about not opening the next box of cereal until the previous one is finished. Maybe you should hide the fresh boxes. NO, she shouldn’t!!! Thank you for channeling your frustration into my reading pleasure! Incidentally, I buy one box of cereal that lives in the fridge which makes it last longer which means it takes up constant space – but I’ve resigned myself to that one box. My cereal shelf looks like something out of Seinfeld. (For non-watchers, that means I always have about 8 boxes on the go at any one time!) And I live slone. In Florida. Where stuff goes stale just by thinking about being open. You need those chip clip things. I have about 10 of them…and one goes on each box of cereal. Kids like to use those clippie things. That way I can have more than 1 box open at a time, without everything going stale.